Today, students are interacting with content on large touchscreen flat panels. Soon, they could be using immersive head-mounted displays. Copyright SMART Technologies. All rights reserved. The way students interact with content on digital displays has evolved quite a bit over the last few years — and it's poised for even greater change in the months ahead. 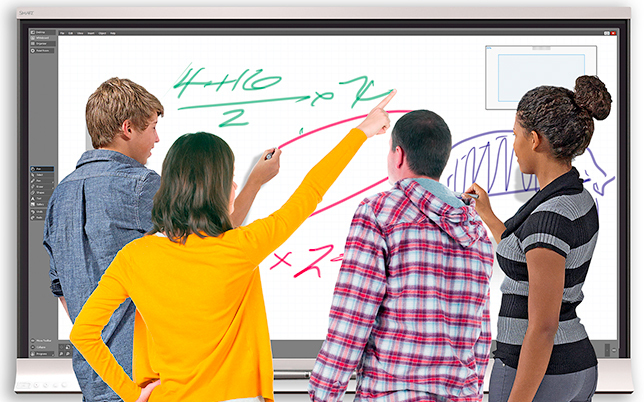 Many schools and colleges have invested in interactive flat panels (IFPs) that students can use as standalone systems without needing an externally connected device. New features and improvements have kept the technology relevant in today's classrooms. But in the future, audiovisual systems on campus easily could include head-mounted displays (HMDs) that immerse students in fully interactive 3D learning environments. Interactive flat panels are finding favor in schools nationwide, said Ken Colson, senior vice president of sales and marketing for Unified AV, a Southeast-based audiovisual systems integrator headquartered in Atlanta. The resolution, brightness and longevity of IFPs have been key selling points, according to Colson. IFPs don't require replacement lamps, and many models support an onboard computer using the open pluggable specification (OPS) slot, so they don't have to be connected to an external device. Android models. The lion's share of interactive displays for education have been powered by software from companies such as Smart Technologies or Promethean, Colson said — but a growing number of IFPs are now taking advantage of the Android operating system. They operate like a giant Android tablet, turning on instantly and providing all the interactivity of a tablet computer. For instance, BenQ announced two new Android-based IFPs during the Texas Computer Education Association (TCEA) conference in February. The 79-inch RP790 features 4K resolution and 10-point multitouch technology, while the 75-inch RP750 features HD resolution, 20-point multitouch technology and a bacteria-resistant coating to help reduce the spread of germs. 4K resolution. Ultra high-definition displays, also called 4K displays because they contain four times the number of pixels as standard high-definition (1080p) displays, are becoming increasingly common as well. While 4K video screens might be too expensive for many schools, their incredibly sharp clarity could help with certain specialized applications, such as for research where fine detail is needed. "When you hit 84-inch panels, all of them are 4K, and a majority of 75-inch panels are now 4K as well," Colson said. For example, all of Smart Technologies' larger displays (65 inches and up) are offered at 4K resolution, he noted. "For 65-inch and 70-inch displays, we're seeing that 1080p is adequate," he added, "but some schools are looking ahead and are starting to buy 4K displays, because they know the source resolution will continue to expand." Videoconferencing. InFocus has added videoconferencing capabilities to its latest IFP, the Mondopad. The interactive display blends video calling, whiteboarding and more in one giant touchscreen PC for face-to-face collaboration, either among students in the room or from remote locations. The Mondopad is available in 57-inch, 70-inch and 80-inch versions. Other uses. A growing trend among schools and colleges is to create "huddle spaces" for small group activities by adding a second or third display to a room, Colson said. Plus, tabletop-based interactive displays are starting to become more common, especially for elementary and special-education classrooms: "IFPs today are much more durable than they were in the past, and so some schools are taking IFPs and turning them horizontally," he explained. Students might be interacting with large flat panels today — but next year, they could be interacting with small head-mounted displays too. For years, futurists have been predicting the use of virtual reality (VR) headsets as an instructional tool. Now, that future is finally arriving, as several manufacturers — including Google, Microsoft, Oculus and Samsung — have brought HMDs to market in the last few months. Google Cardboard is a simple, affordable 3D viewer that turns an Android phone into a panoramic display. The Google for Education team has designed Expeditions: virtual field trips that take advantage of the technology to provide immersive, interactive experiences — such as exploring the bottom of the sea or the ruins at Machu Picchu — that bring lessons to life for students. On March 30, Microsoft is releasing a developer version of its HoloLens technology, which it calls the "first fully untethered, holographic computer," enabling users to interact with high‑definition 3D holograms. Microsoft has partnered with Case Western Reserve University and the Cleveland Clinic to develop anatomical 3D images that medical students can explore, manipulate and examine from every angle. "We've been teaching human anatomy the same way for a hundred years," said Case Western President Barbara Snyder in a video about the technology. "Students get a cadaver, then they look at medical illustrations — and it's completely two-dimensional. But the human body isn't." 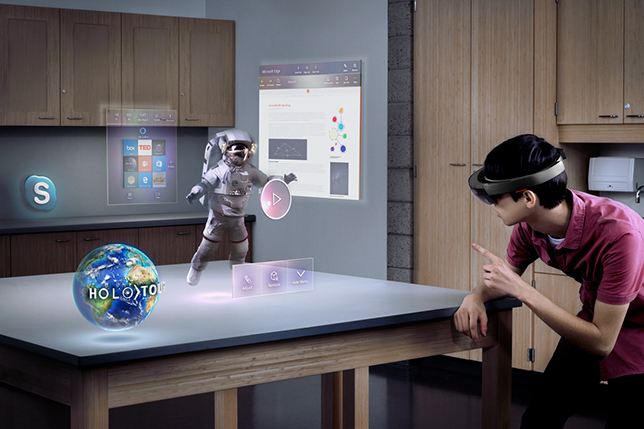 The HoloLens technology will allow students to interact with 3D content in ways they couldn't before. 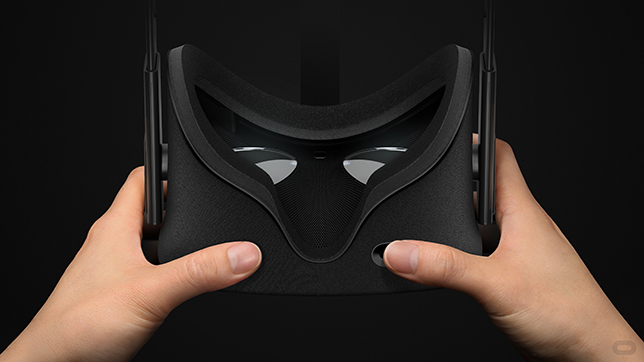 The Oculus Rift, a $599 head-mounted VR display, is available for pre-ordering. 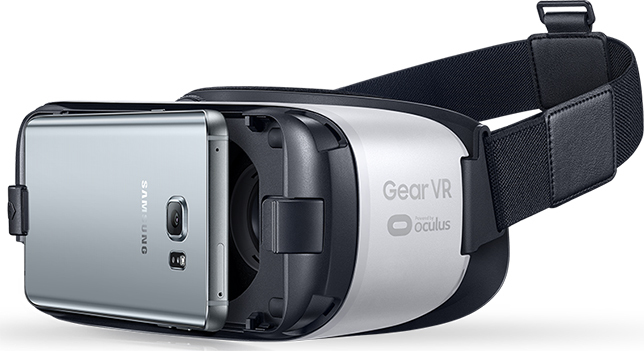 And Samsung has developed the Gear VR headset, which is based on Oculus technology but costs $99 and works with a Galaxy phone. Samsung's Education division said it's looking for schools and colleges to pilot the technology. Market growth. HMDs, which sold about 140,000 units in 2015, are expected to sell about 1.43 million units in 2016 and 6.31 million units in 2017, according to a forecast from research firm Gartner. Brian Blau, the analyst who wrote the report, said he doesn't know how many of these sales will be for education. But he sees many possible uses for the technology in schools and colleges — from occupational training to investigative learning. "I'm a big believer in giving kids immersive technologies such as VR," said Blau, research vice president for Gartner's Personal Technologies: Innovation division. "It's such a powerful platform, and it will bring the world to kids wherever they are. Because it's immersive and 3D, their experiences have a real potential to be much more personal and meaningful." Education applications. The 2016 Horizon Report from the New Media Consortium (NMC) predicted that virtual reality technology will be adopted by at least 20 percent of colleges and universities worldwide in the next two to three years. At Penn State, the report noted, engineering students tasked with virtually assembling an object completed the project more efficiently when using the Oculus Rift VR headset and a haptic glove, compared to students who used a mouse, keyboard and computer program. And at Boise State, nursing students are using Oculus Rift headsets to learn proper procedures for inserting catheters. The virtual reality method is less expensive and requires less space than using traditional mannequins, the report said — and it provides better real-time feedback for students. "The compelling aspect of virtual reality is its ability to transport learners into environments and situations that they otherwise may never have access to," said Samantha Adams Becker, senior director of publications and communications for the New Media Consortium. "Being able to walk among dinosaurs in a fifth grade history class, being able to simulate surgeries for medical students — the potential applications are as unlimited as one's imagination."